NOTE: This is a presale. The bag will be made within 40-60 working days from the confirmation of payment. 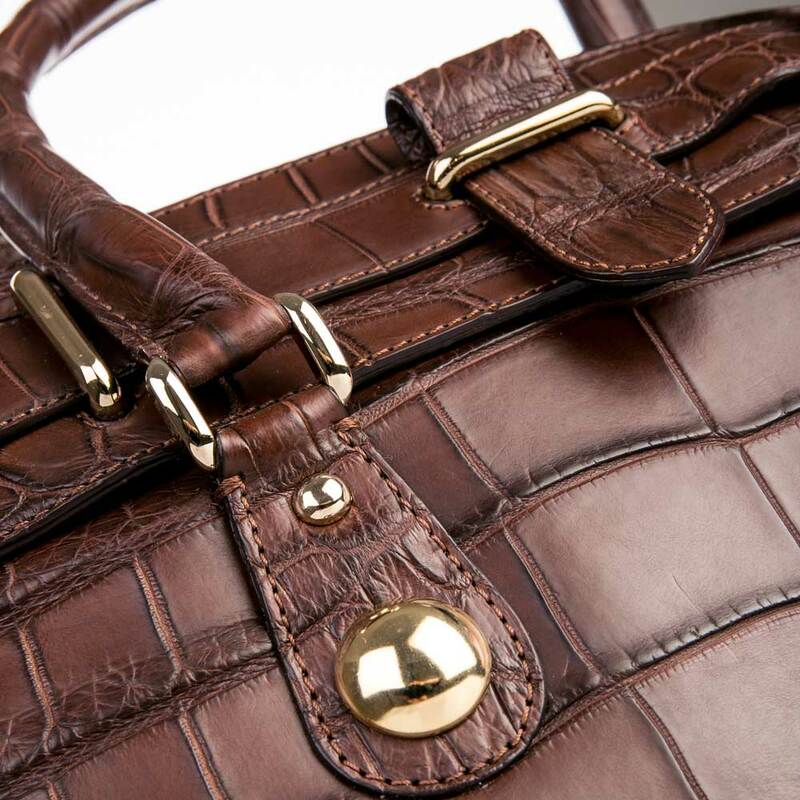 This special crocodile handbag 4818 will certainly satisfy every kind of woman, from the one that is always busy with her work, to the fashion one having her notebook exploding of dates and appointments. OUTSIDE COMPOSITION : genuine Alligator leather (of elevated quality and realized in dark brown tonality, the leather shows some flat and squared scales in the central section of the bag, while scales are smaller and rounded at the sides). LINING : very high qualitative beige fabric. HANDLES : they are not adjustable and rigid, provided with a semi-circular shape and realized in the same color and leather as the bag. These two short handles are attached to the handbag thanks to four rectangular golden buckles. 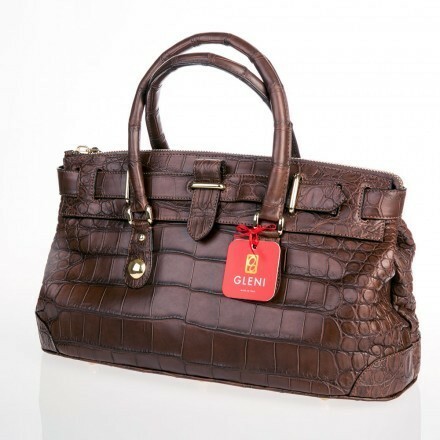 DESCRIPTION : Wide tote bag made of soft genuine alligator leather of undisputed quality in dark brown tonality. For this bag we used 2 very wide leathers of crocodile. - an internal lateral zippered pocket. 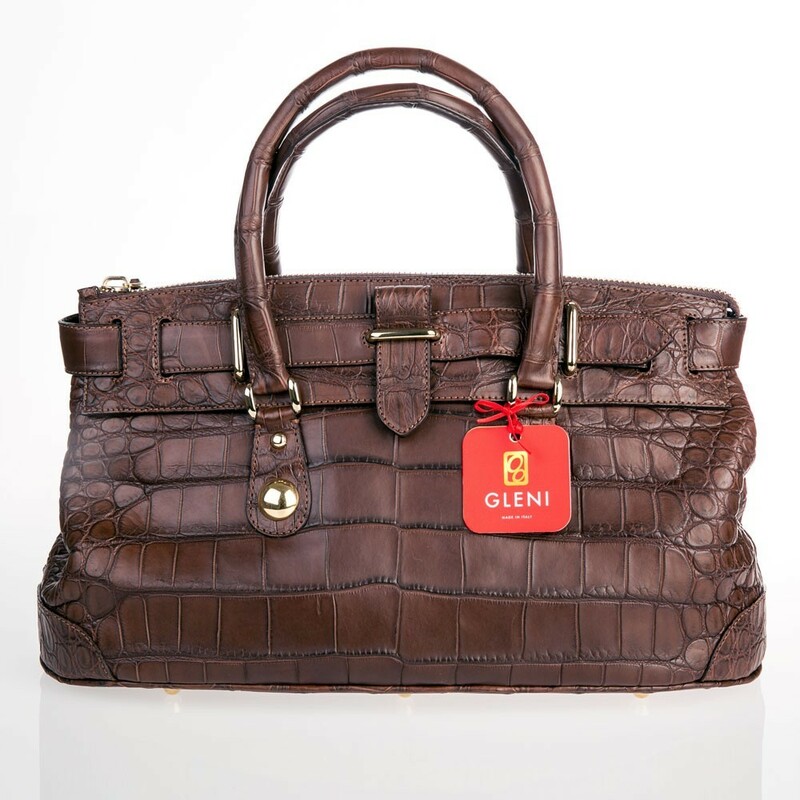 This special handbag, made of genuine alligator leather in dark brown tonality, will certainly satisfy every kind of woman, from the one that is always busy with her work, to the fashion one having her notebook exploding of dates and appointments. Our bag belonging to the line Royal of Firenze collection, is comfortable and capacious, but also chic at the same time. The golden details such as the metal label and the accessories decorating the handles are perfectly combinable with the color of the leather, enhancing the prestigious quality of the genuine Italian craftsmanship. The texture of the skin takes over the fantasy created by the scales on the dummy of the alligator, remaining very large and squared in the central section while they are round and smaller at the sides. The inferior sides are embellished by some applications in the same kind of leather as the bag, with the adding of some gold accessories giving freshness to the item itself. 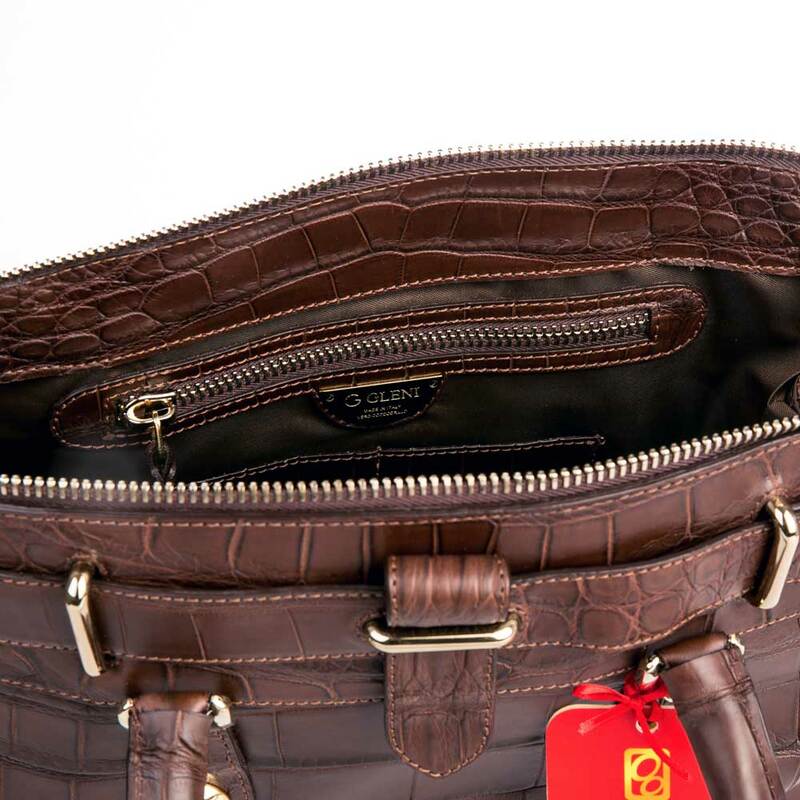 The upper section, on the contrary, is tightened by a small belt which confers a touch of elegance to the whole bag. The item is closed by a golden zipper, like the rest of the bag. The inside is made up of a single internal compartment, enriched by a lateral zippered document pocket and by two cell-phone pockets. The label with the name of our brand shines on the beige colored fabric, making the inside really precious. 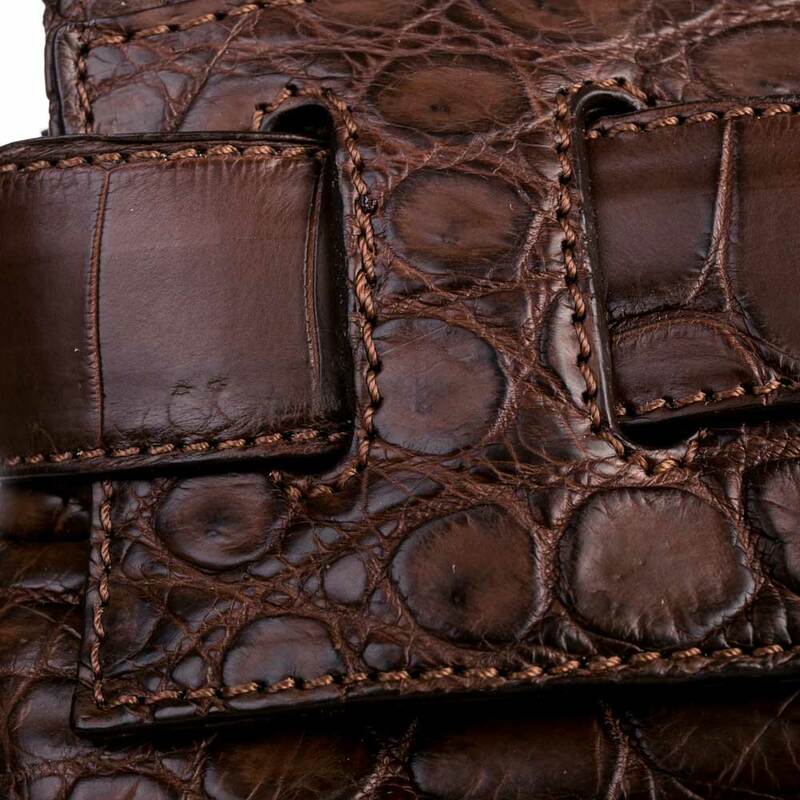 Despite it looks like very rigid in structure, the genuine alligator leather is very soft and its shape follows the trends of the moment. What are you waiting to confirm your purchase? This prestigious accessory will be surely envied by any other woman passing next to you. Put the item you prefer in the cart and then complete the information for the check-out; choose the payment method you prefer and complete the order. The order will be ready in 40-60 working days. Periodically, we will contact you via e-mail to give you updates on the order.